Cook and drain tortellini according to package directions. Place tortellini in large bowl. Add olive oil; toss to coat. Add all remaining ingredients except olives, salt and pepper; toss gently. Add olives, salt and pepper; toss gently. Cover and refrigerate at least 1 hour or overnight. Just before serving, toss gently. Be sure to not over cook the pasta. It is best when cooked al dente. 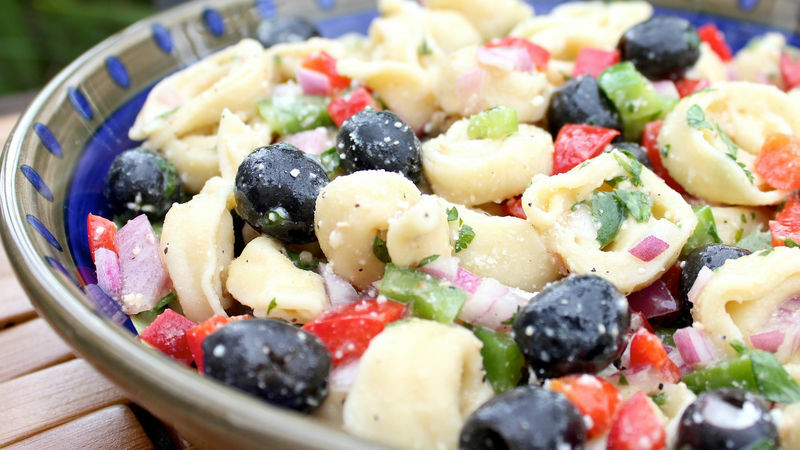 Pasta salad can be made a day or two in advance and stored covered in the refrigerator. If salad seems too dry when ready to serve simply add more salad dressing and toss before serving.